Yesterday's grooming appointment went smoothly. Tasha didn't whimper or bark when I dropped her off and she was happy when I picked her up. The groomer said she behaved very well. Poor Callie used to tolerate the grooming, but hated when I left her, and strained on her leash to get out of there while I was paying the bill. Different dog, different experience. All pretty and sweet smelling. For the time being. 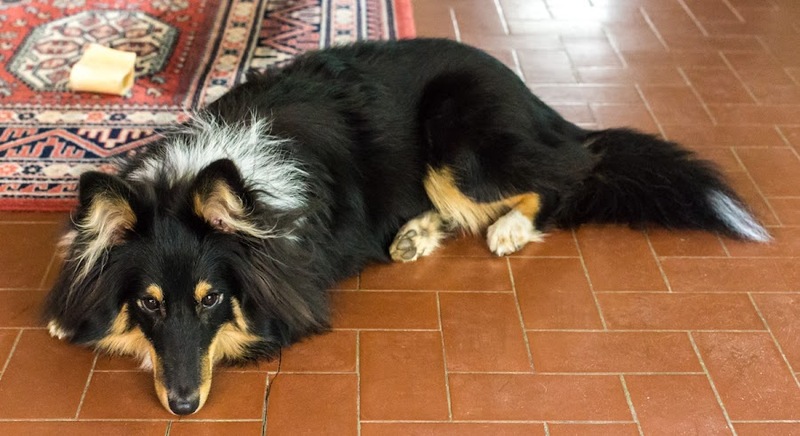 According to the groomer, Tasha still has her puppy undercoat, so she's still very fluffy looking, but it won't be long before the adult undercoat takes over and the shedding begins. You will have a lot more dog hair on your floors then, she said with a smile. Oh well, we're used to it. 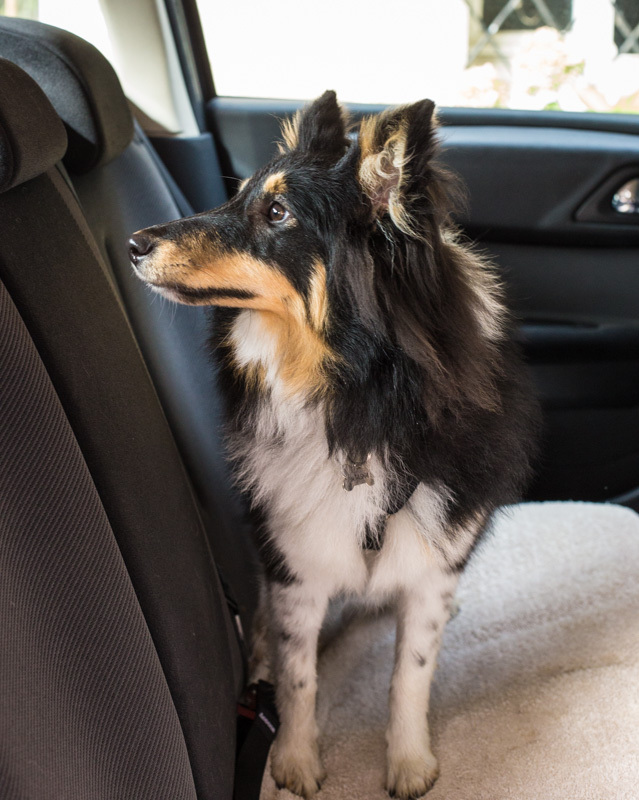 The new development is that Tasha jumped into the car without help for the first time. Up until now, I've had to pick her up and put her in. She didn't object to getting in the car, she just didn't jump in on her own. So now I'm hoping that she'll jump in every time. I'm constantly reminded that Tasha is still a puppy and is still learning, and will be for many months to come. I was in a boulangerie (bakery) the other day to get some bread and I noticed a pile of these little maps on the counter. I took one, of course. The bakery is on the main road from the center of Saint-Aignan to the zoo, so there is the potential for a lot of tourist traffic. I thought the little water color of the château in Saint-Aignan was pretty. 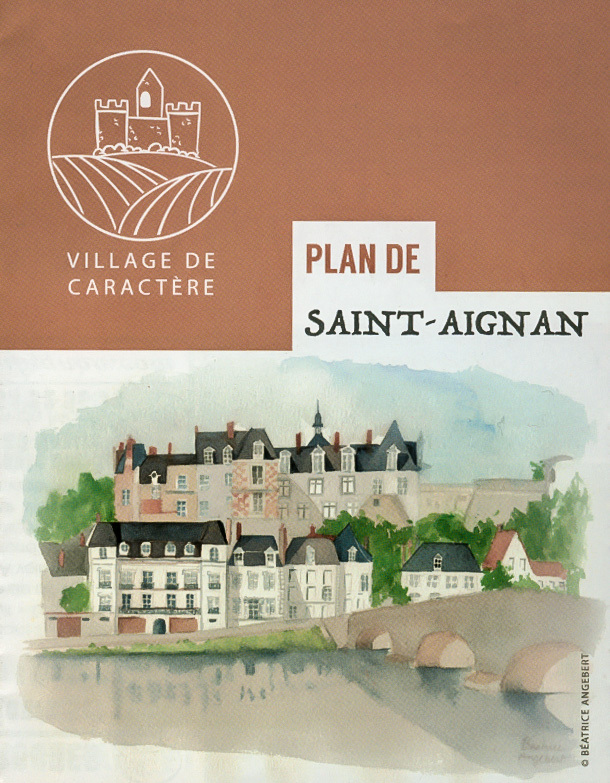 So now Saint-Aignan is a "village of character." Saint-Aignan on the Cher River. The artist credited is Béatrice Angebert. Inside, there is a little map of the town, as you'd expect, surrounded by a lot of ads for local businesses. On the flip side, there is a map of the region showing the locations of the big châteaux that are open for visits (Chambord, Cheverny, Chaumont, Chenonceau, et al.). The maps are not great, but adequate for a general idea of where things are. They are basically a vehicle for advertising local businesses. I recently did a little gardening. We had some lavender plants in the ground out back that had, over the years, got quite overgrown. The main stems were very thick and woody, and I read that lavender doesn't like to be pruned back to bare wood, so it was time for them to go. With some effort, I managed to dig them out of the ground. 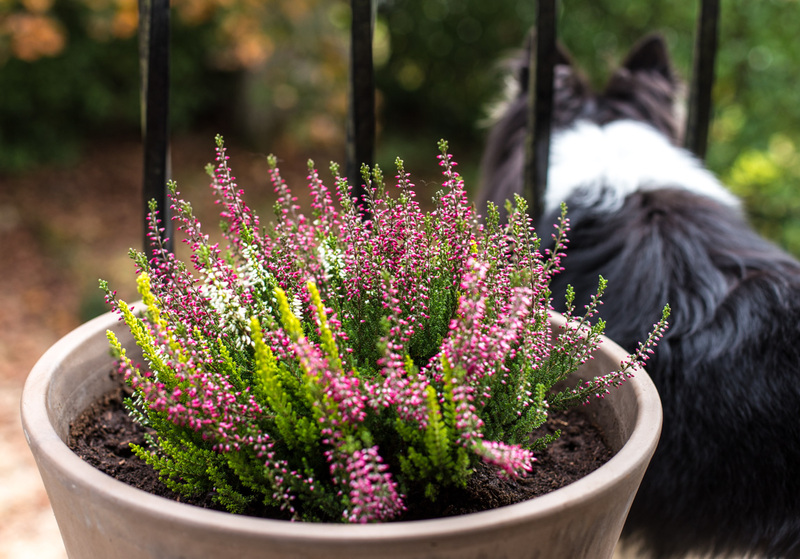 Calluna (heather) in one of the big pots. Tasha was watching birds on the ground below. I had a plan to replace them. For a few years now, I've kept rozanne geraniums in a couple of large pots on the deck. They produce nice blue flowers, but they like a lot of room and I think the pots, as big as they are, were not quite big enough. So I took them out of the pots and planted them directly in the ground where the lavender was. The space and the sunlight should be what they like. To replace the geraniums in the pots, I found some calluna (heather) on one of my trips to the garden center and thought they would fit the bill. So, it is done. I'm hoping the heather will mound up and fill the pots. They flower in the fall, as they are in the photo, but otherwise stay green throughout the year. Back in San Francisco, our house had a fireplace in the living room that had been fitted with a glassed-in insert and a very noisy fan that supposedly blew warmed air into the room. We never used that fan. Firewood was hard to come by in the city, so we burned Duraflame logs, those pressed sawdust things that approximate a cozy fire. Then I found this candle holder that would fit inside the fireplace. It made a nice impression of a fire. Sort of. 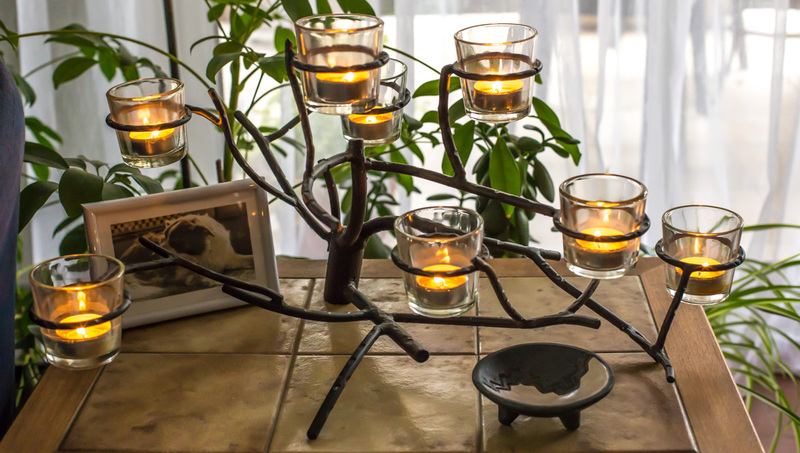 It's made to look like a tree branch, with little tea lights in glass. So here it is again, nearly fifteen years since we lived in the house in San Francisco. I thought it might look nice in the living room this fall, before we put up the holiday tree. A old photo of the fireplace in our San Francisco house, just for fun. Our very nice arrière saison is ending. That's an interesting expression, literally translated as "the back season," and it describes a prolongation of nice weather beyond summer into the fall. I've often confused the term with l'été indien (Indian summer), also called l'été de la Saint-Martin (Saint Martin's Day summer), but technically it's not the same thing. These grapes grow against the stone wall of a building in the vineyard. I think they're eating grapes. They're not harvested for wine. My extensive quick and dirty research reveals that a true Indian summer occurs later in the fall (Saint Martin's Day is on November 11) and is normally preceded by the first hard frosts of the year. We haven't had any frosts yet this season, light or hard. We did have some chilly weather with rain, but that's not the same thing. So we have yet to see if we'll get un été indien over the next few weeks. In the meantime, we've enjoyed our très belle arrière saison. Et la lumière fut. There's a lesson in verb tenses! The title says, "Let there be light," and uses the subjunctive form of the verb être (to be). The first line says, "And there was light," and uses the passé simple (simple past tense) of the same verb. And so I put up new light fixtures in the bathroom last week. The new fixture over the mirror and bathroom sink. The wiring of the ceiling fixture gave me some trouble. There were three wires to connect and I mistakenly assumed one of them was a ground wire. It was not. There were two live wires and one neutral wire. The plumber figured it out (he tested the wires with one of those fancy testers) and put the right wires in the right connectors. Now everything works. The second fixture (same as the first) installed on the ceiling. These fixtures replace the ones we installed fourteen years ago when we moved in. They have four spots each, whereas the old ones had two spots (over the mirror) and three spots (on the ceiling). We used halogen bulbs in the old fixtures; the new ones have bright LEDs. I did have to drill new holes, patch old holes, and sand and paint, so the job took several days. It was worth it. Ken made it home pretty easily, even though there was a little glitch that delayed his train. But it worked out all right because I took a wrong turn and was late getting to the station. Tasha was happy to see him and now things are back to normal at home, except for some jet lag. Another autumn view among the grape vines. We're expecting a couple days of nice weather, compared to the last couple of days of overcast and drizzle. I'm planning to take advantage of the weather and barbecue steaks for lunch today. I'm also getting a haircut this morning. Yesterday's grooming appointment didn't happen after all. When we got there, the groomer looked puzzled, like she wasn't expecting us. 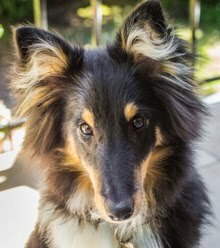 It turns out that she forgot to write Tasha's appointment in her book and, consequently, had another dog booked in our slot. No problem, I said, we can come back another day. So we're on for next Monday. Our morning walks are on-leash now. But Tasha doesn't mind. The groomer has a kennel on her property where she boards dogs. She has a cat area, too. There was a lot of activity yesterday morning when we were there. 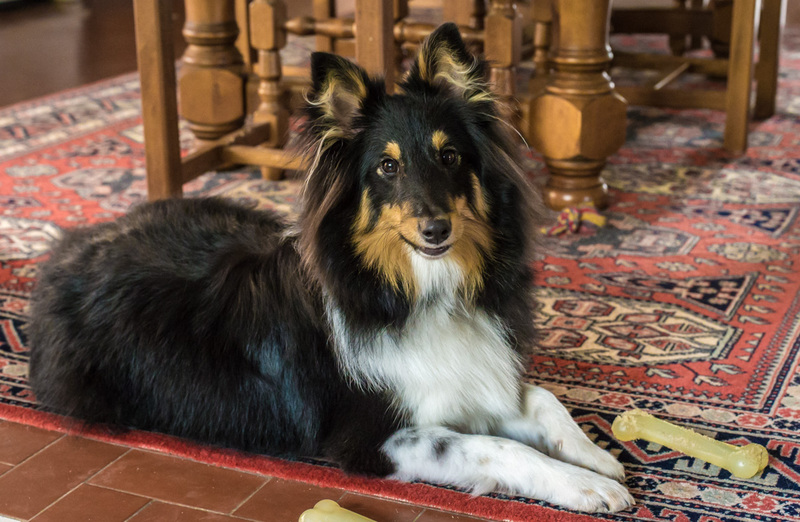 She offers a zoo day care deal for people who are traveling with their dogs. Tourists can drop their dogs off for the day so they can go to the zoo and not have to leave their dogs in a car. I think it's a real good idea and so, obviously, do a lot of other people. Monday was chilly with some drizzle, so I built the first fire of the season in the wood stove. It was nice and toasty in the living room all afternoon. Ken is back in France! We're off this morning to pick him up from the train station. 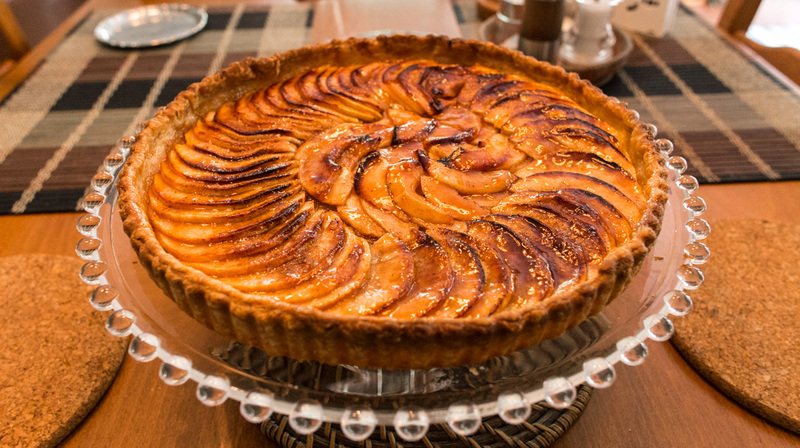 Now that it's feeling like fall again, I decided to make an apple tart. The supermarket had some nice looking Gala Reine des reinettes apples on Friday, so I picked up a few. On Sunday morning I made my standard pie crust and blind-baked it. Then I mixed a small amount of ground cinnamon, cloves, and nutmeg into some white sugar and dusted the empty shell with it before peeling, coring, and slicing the apples. Once the apples were laid into the shell, I sprinkled a little more of the sugar mixture on them before baking it all in a hot oven (200ºC or 390ºF) for about twenty-five minutes. The crust was crisp and flaky, and the apples were perfectly done. After the pie was out of the oven, I glazed it with some of Ken's home-made plum jam. 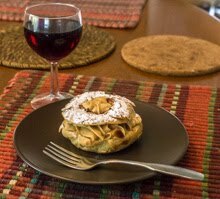 It turned out great, being the first apple tart I've made this season. I'm sure it won't be the last one. And there is plenty left for when Ken gets home tomorrow. Fall is mushroom time. They sprout up all over the place: in our lawn, on decaying trees, among the grape vines and, mostly, in the woods. I see many different varieties on our walks, some are even edible, although I would never gather my own mushrooms. I'll leave that to the experts. 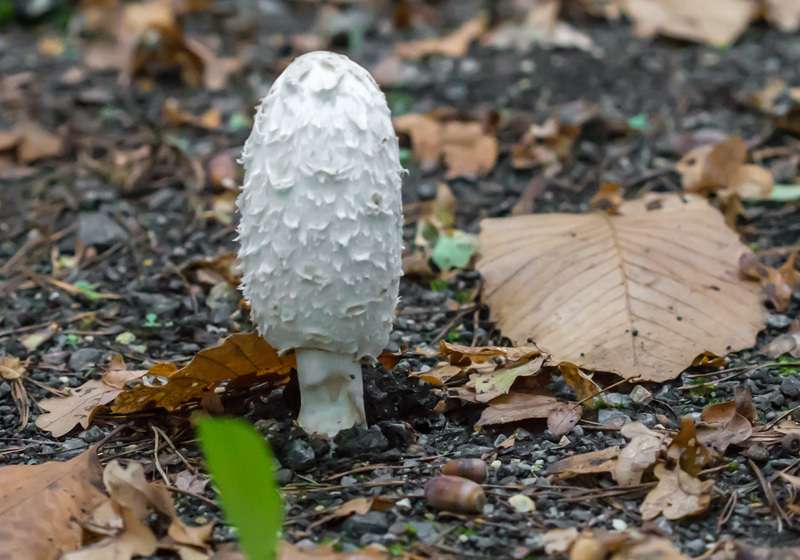 This one is a shaggy ink cap. It sprouted, among others, in the place where I normally see them every fall. A shaggy ink cap before it opens fully. Supposedly, they're edible in their early stages. I've never seen a toad sitting on a mushroom. Wikipedia says that the term "toadstool" derives from German fairy tales telling of toads sitting on mushrooms to catch the flies that are attracted to them. In French, mushrooms are called champignons, originally from the Latin campania, "product of the country." No toads. Wikipedia also says that our word "mushroom" probably comes from the French mousseron, having to do with moss. I make lists. I have a little pad of paper on my desk, always at the ready, for a list or two. Often, it's a list of items that have to be entered into the check register that I keep on the computer. I have a shopping list that I keep for our trips to the US. I have a list of things we want to get on our next trip to the Asian grocery. Right now, I have a list of things that I wanted to get done while Ken is away. Of the ten items on that list, three remain to be completed. One of the vineyard parcels that Tasha and I frequently walk by. There are other things I've done that aren't on the list, of course. Like moving the burn pile. I didn't plan to do that this past week (it's been four years, after all), but the spirit (and the good weather) moved me to get it done. I also made an appointment to get Tasha groomed on Monday, but that wasn't on the list, either. At least two of the three things left on my list will get done this weekend, I'm certain. On Tuesday, Ken gets home. Tasha and I will pick him up at the train station. That's not on the list, but it's on my calendar which is, after all, another kind of list. Four and a half years ago, we had the line of hazelnut trees along the north side of our back yard cut down to hedge size. I asked the guys who did the work to leave the trunks in piles in the yard so I could saw them into firewood. There were three big piles. One I took care of that year. The second, I think, I sawed up the following year. The third, however, sat there under our large fir tree for over four years. Until yesterday. You might be able to see the moved pile out in the garden plot (center-right in photo). And there's Tasha, always ready to play help. 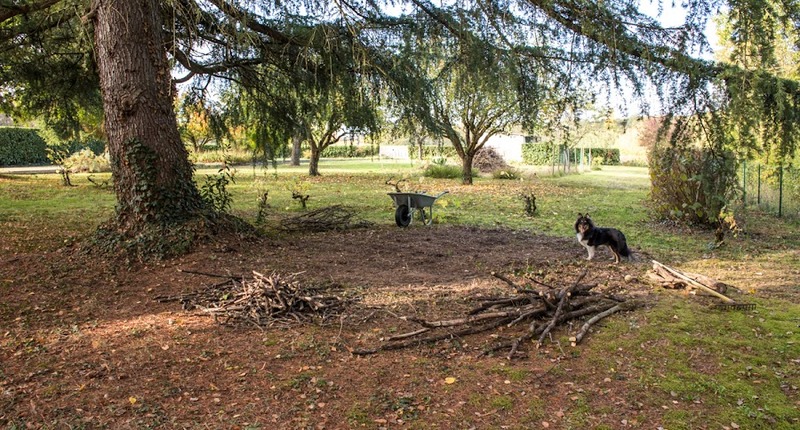 Over the years I tossed large branches and other prunings onto the pile. I've picked through it from time to time for kindling. For over four years I've been saying that I'm going to move that pile into the garden plot and burn it. I finally moved it on Thursday morning. It took about an hour and a half. I kept some logs and branches out to burn in the wood stove. It's free wood and kindling after all. I moved all of that to a sheltered spot in the afternoon. Burning may happen one day this fall when it's foggy so that the smoke is less of an eyesore. This is the view of our hamlet from out in the vineyards on Tuesday afternoon. The vines are planted on the heights above the river, which runs from right to left down in the valley behind the buildings you can see. On either side of the vineyard, where the land curves downward into the woods, are ravines where streams run down to the river valley. 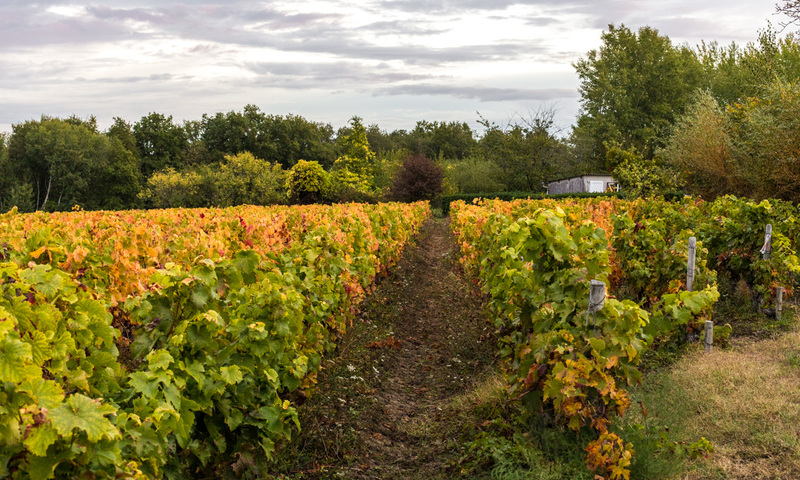 The vines are planted on the higher land where water drains quickly to the streams and river. Looking roughly toward the northeast. Our house is the building on the left. The plumber that did our shower came by yesterday with the representative of the manufacturer that made our new shower door. In August, one of the hinge plates detached from the glass door. The plumber used a powerful adhesive to stick it back on, but said he'd call the manufacturer about it and, at the very least, get the guarantee extended. Well, the rep needed to come by to verify that the door was properly installed. After five minutes he said, "OK." He'll do the paperwork and order a new door, which we should have in about a month. Then I asked the plumber, who also dabbles in electricity, to take a look at my botched attempt at installing the ceiling light fixture. He had it fixed in no time and now it works perfectly. No charge! Again, the right tools and a little savoir faire. I took the camera out on Tuesday afternoon to try to get some shots of the vineyard in its yellow stage. The sun was bright in the western sky, about two hours from setting. I attached Tasha's leash to my belt (I should probably get one of those jogger's leashes) and headed out. I'm not used to taking pictures in such bright sun since I'm normally out at dawn or dusk and it's often cloudy. There are some rogue red leaves among these yellows. And there's still a lot of green mixed in. 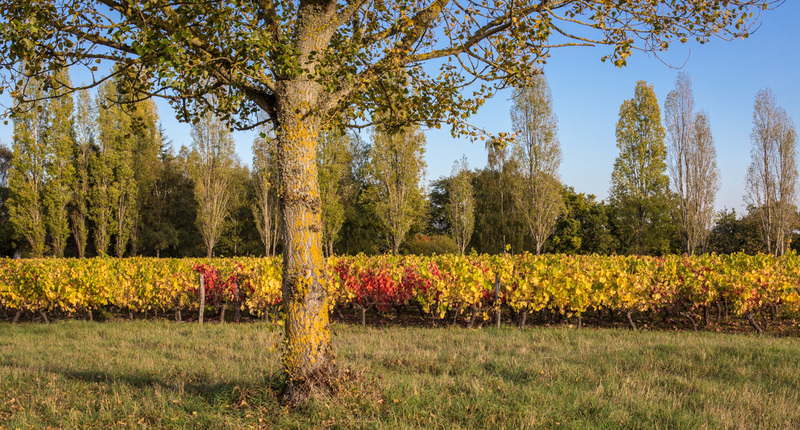 After a while, the leaves on the grape vines will turn a golden orange color for a brief time before falling to the ground. I hope I can get some photos of that again this year. As usual, it all depends on the weather. 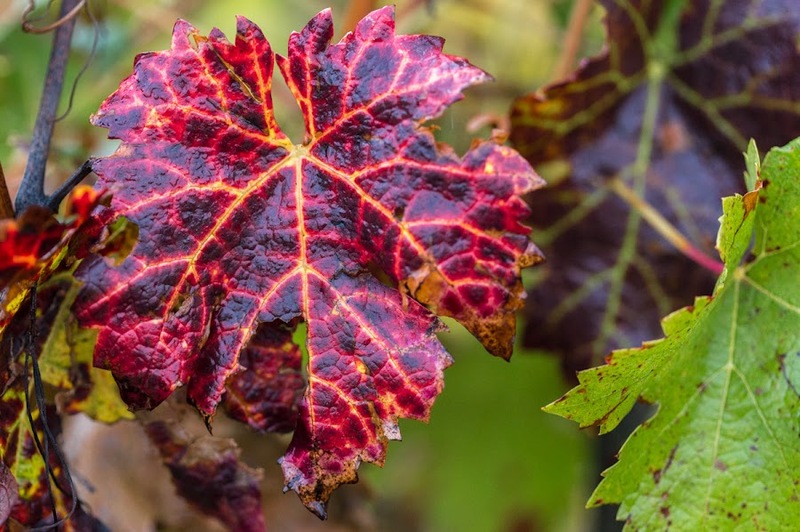 Hard wind and rain can rip the leaves off the vines quickly once they've started to fall. I went to the garden center yesterday and found a bag of soil made specifically to amend outdoor flower beds. I worked it in and it looks good. I also got a sack of acidified soil for the heather. Today is transplanting day. It's supposed to be cloudy and a little cooler, but without rain. Tuckered out! Here's Tasha resting after some vigorous ball chasing outdoors. I throw the tennis ball, she runs after it and retrieves it. Then she brings it back toward me, but no to me. She trots in a circle around me, just out of reach, daring me to come and get the ball. If I move toward her, she darts away. Hahaha, what fun. Not. My new strategy is to just to ignore her and continue whatever I was doing. At that point she'll drop the ball somewhere near me so I can pick it up and throw it again. Chasing tennis balls is hard work! On Monday I turned the soil in that spot where the lavender was. It was packed pretty hard. I think I'll need to add something to it before I plant the rozanne geraniums and flowering bulbs I want to put there. Another trip to the garden center. I need a sack of terre de bruyère (acidic soil) anyway for some calluna (heather) I got to replace the rozanne geraniums. They're currently in big pots on the deck. The harvest of 2017 is in the barrels, or tanks, fermenting. 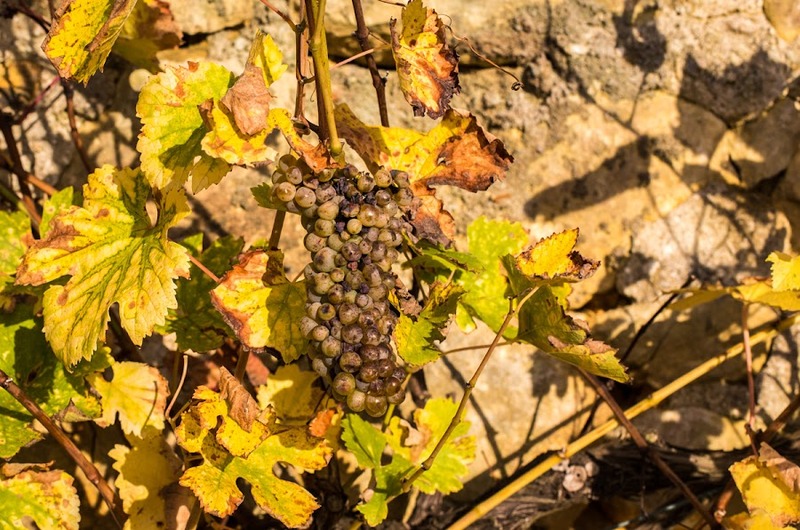 Soon the first of the bernache, that fizzy semi-alcoholic grape juice which is very, very young wine, will make its appearance at markets around the region. 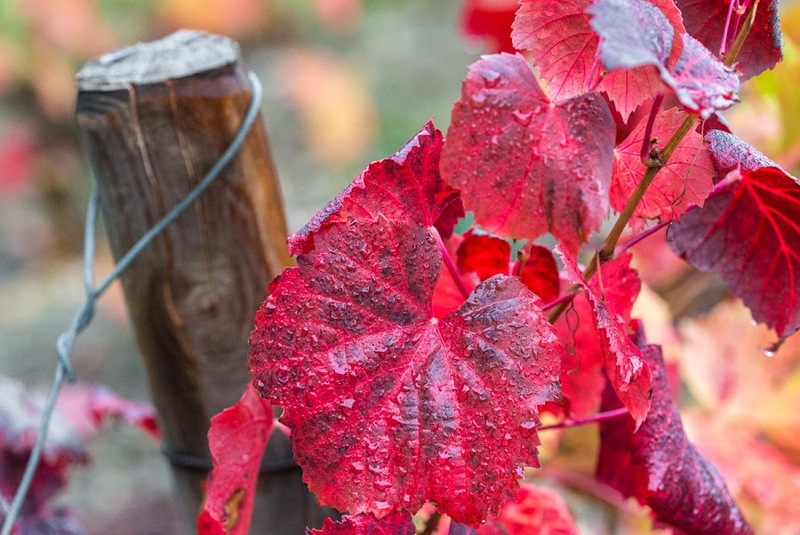 The primeur wines (our region's version of Beaujolais Nouveau) will show up toward the end of November. 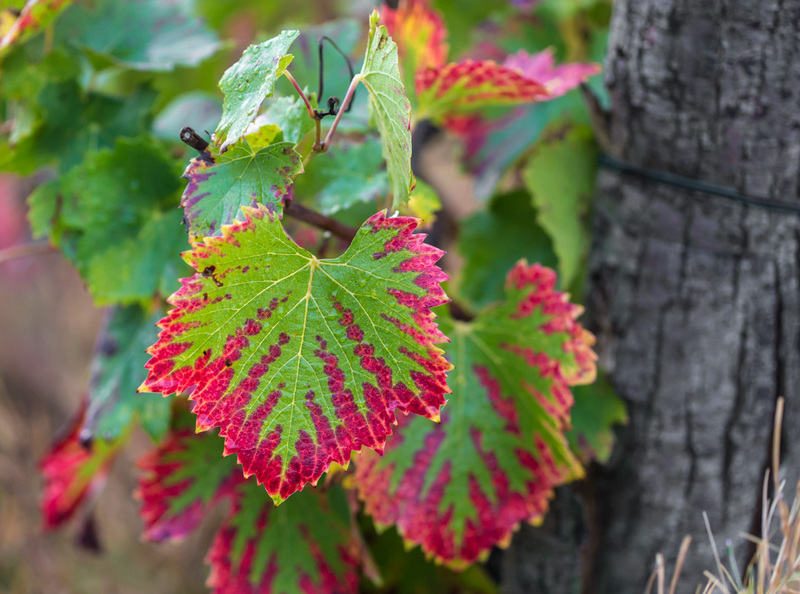 The vine leaves are turning color and starting to drop. All that's left on the vines now are bare bunches, picked clean by the mechanical harvesters. Through the winter, these vines will be pruned down to a single cane. We had a nice day on Sunday, doing basically nothing. Except that Tasha and I went to the supermarket (she stayed in the car). I wanted something to grill since the weather was so nice. I thought a piece of salmon would be tasty, or pork chops. Well, the few chops they had didn't look so good. I found faux filet (what we would call sirloin) on sale, so I got the steaks. There were three good-sized steaks in the package. I grilled one and the other two went into the freezer for another time. The weather was glorious, but I did no yard work. We're expecting two more days of bright sun and warm weather before fall returns. According to the reports, hurricane Ophelia is far enough out in the Atlantic that it will miss France, except for maybe the western tip of Brittany, but it's heading directly toward Ireland and Britain. The storm should no longer be a hurricane when it hits, but they're saying it will still be a strong storm. Today is this blog's 12th birthday! It's weird to think that I've been doing this, almost daily, for twelve years. How much longer can it last? Facebook and Twitter and Instagram seem to be the social media fashion these days. But I like the creative control I have with the blog. I'm a old fogey, I guess. I remember thinking that 8-track tapes were cool. Oops. I preferred Beta to VHS. Lost that one, too. I still use paper maps on trips. I'm afraid that if I give a car the opportunity to tell me where to go... it will. I refuse to give up my land-line telephone. I'm uneasy about having a phone that's smarter than me. So there you have it. I continue to blog. Now, if you'll excuse me, I have to go and get the milk bottles out of the icebox. These thorns make me think of shark fins. But the colors are what caught my attention. The stem is a very pale purple and the thorns' color reminds me of "burnt sienna," that classic old crayon color. 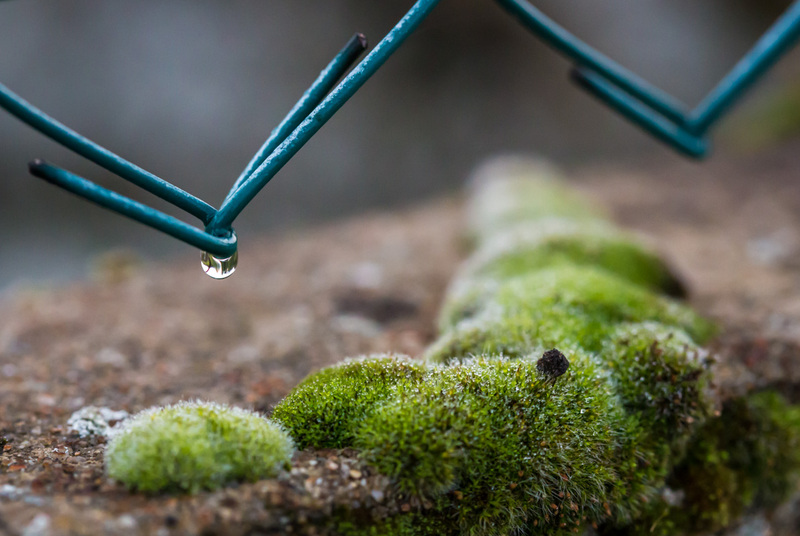 The dew drops just add to the other-worldliness of the image. At least to my eyes. I don't know if this is blackberry or wild rose. CRS (Can't Remember Sh*t). Saturday was another productive day. Tasha and I played ball and in between throws I picked up apples. If only I could get her to pick up apples and put them into the wheelbarrow, but she'll only look at an apple if I toss it across the yard. Then I used a spade and a pick-ax to dig out the three lavender stumps that I left in the ground on Friday. It took a while, but I got them out. Now I have to turn the soil, perhaps amend it, and re-plant. After lunch I cut the remaining grass that I didn't cut on Friday. The sky was cloudless and the air was comfortably warm. Depending on the weather over the next few weeks, I may cut the grass one more time before winter, if only to mulch the leaves from the apple and linden trees after they finish falling. I'm not planning anything major for today except to watch the tennis final from Shanghai. Federer vs. Nadal. Again. I guess these all start looking alike after a few. No matter. This one is different looking, even though the colors are similar to previous leaves. I didn't notice that part of the leaf was missing when I took the picture. Friday started out foggy and heavy with dew, but it turned out glorious around mid-day. I repaired a closet shelving unit before the sun even came up, and sorted through the clothes that were stored there. I have two piles started: clothes to donate and clothes to throw out (ripped, frayed, and otherwise not suitable for donation). Before lunch, I cleaned up the tamarisk branches and cut the lavender down. I still have to pull the roots out and prepare the ground for new plants. I have some perennials and bulbs I want to plant there. After lunch, I cut the grass in part of the yard and along our road. I'll do the rest on Saturday. Here's another one. Don't ask me which varietal this is, I have not learned to recognize them by the shape of their leaves. From what I can tell, there are at least six varietals grown in the vineyards around us. The most common are gamay (red) and sauvignon (white). Then there are cabernet, côt, and pineau d'aunis (all reds) and some limited amounts of chardonnay (white). Christmas colors! But they won't last long. I had some frustrations with the bathroom light fixture yesterday. It's up on the ceiling, but I can't get it to work. Without going into the details, there are two fixtures in the room. One on the ceiling and one above the sink. I replaced the one above the sink a few weeks ago. No problem. The two fixtures are somehow connected through the wiring, but they operate independently. However, I cannot get the new one to work. I hooked up the wires a few different ways to no avail. It's not faulty as far as I can tell because it did light up once but, when it did, the other fixture wouldn't. So I'm going to have to call a professional in to help. The wiring connections on these new fixtures are slightly different from the old fixtures, so there's obviously something I'm not understanding. 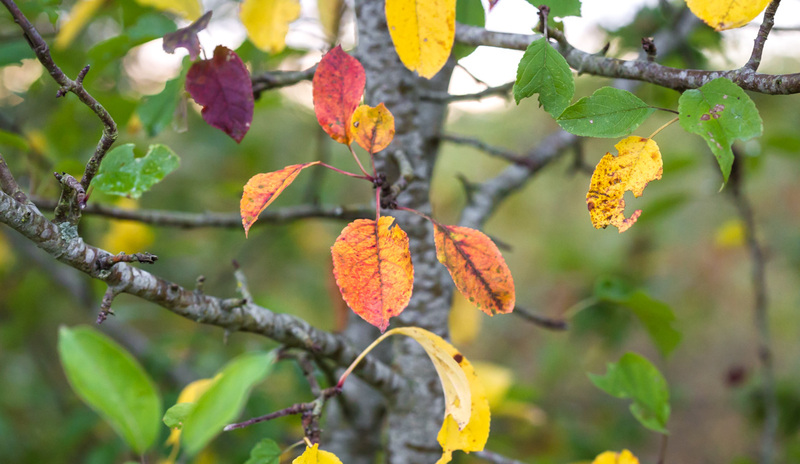 Next up in the parade of colors are the most common of the colors we see around here in the fall: orange and yellow. Of those, there is much more yellow than anything else. I think it might be a little too early for a lot of the oranges. Our red maple trees, for instance, turn a bright orange just before they fall, but that usually doesn't happen until early November. Orange and yellow, a little dark red, and green! Work continues around the house. Yesterday I replaced the bathtub faucet. When we had the new shower built last fall, we asked the plumber to put the old shower faucet in the bathtub, which he did. Turns out we don't like it all that much. It's thermostatic, and you can't get just cold water. The lowest temperature setting is 20ºC (just under 70ºF). So Ken found a new standard faucet and I installed it. 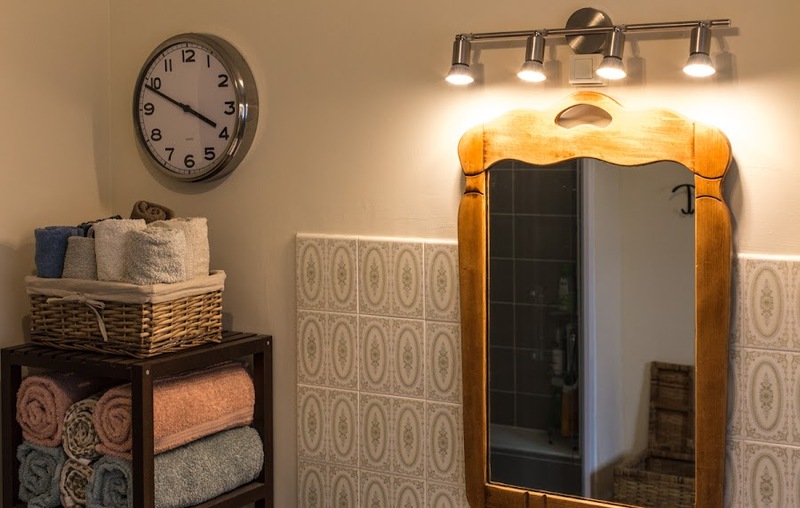 I'm also working on replacing the overhead light fixture in the bathroom, replacing the old halogen fixture we put in fourteen years ago with a new LED fixture. The project involves drilling, spackling, and painting because the two fixtures are different sizes (of course). I need to allow time for drying, so this project will take a couple/three days. I also did some more ivy trimming and played some ball with Tasha. You can't escape it this time of year, at least in the woodlands of the northern hemisphere. The leaves are starting to turn and fall. And you can't escape it on my blog, either. There will be more. Up first: scarlet. These are grape vine leaves, of course. Tasha and I spent our first whole day alone at home on Tuesday. I can tell she wonders what happened to Ken, but she's not freaked out or depressed or anything. She's in familiar surroundings and she gets her walks and her food and some play time, so most everything is right in her world. We spent the day puttering around the house, doing little things here and there that needed to be done, and watching tennis on tv. We also spent some time out in the yard playing ball, trimming ivy, and raking up the mess. As you probably already know, Ken left yesterday for Paris, where he spent the night before his flight out to the US this morning. I took him to the TGV (Train à Grande Vitesse) station just outside of Tours, where the high-speed train provides a direct link to Charles de Gaulle airport. It's about a 45 minute drive. We put Tasha in the car and away we went. Tasha on her towel in the back seat before we left. Her harness is connected to a short leash that hooks into the seat belt buckle for safety. She can move around easily, but she can't jump into the front of the car, and she won't go flying if I have to brake hard. Tasha doesn't mind the car like Callie did. She was standing up and looking out the windows most of the way. We stopped at IKEA in Tours for a couple of things before going to the train station. Ken walked her around the parking lot while I ran in and out of the store. Then we parked near the station and sat down at an outdoor café for a while since we were early for the train. Tasha was excited and curious about being in a busy urban environment for the first time, and she behaved very well. We left Ken at the station and drove home. Tasha was fine. When I took her out of the car, I noticed that she had lost her lunch on the towel that covers the back seat. It wasn't gross or anything, and the towel did its job protecting the upholstery. But I wonder why she waited to throw up on the way home, and not on the way to the station? Oh well, once again I'm reminded that Tasha is still just a puppy. There's a lot of moss growing on the wall that separates one of the houses in our hamlet from the road through the vineyard. Well, there's a lot of moss growing pretty much everywhere around here. I noticed this patch on Friday morning. I've forgotten whether it had rained or if there was just heavy dew, but everything was wet. It's a short wall with a chain-link fence on top. 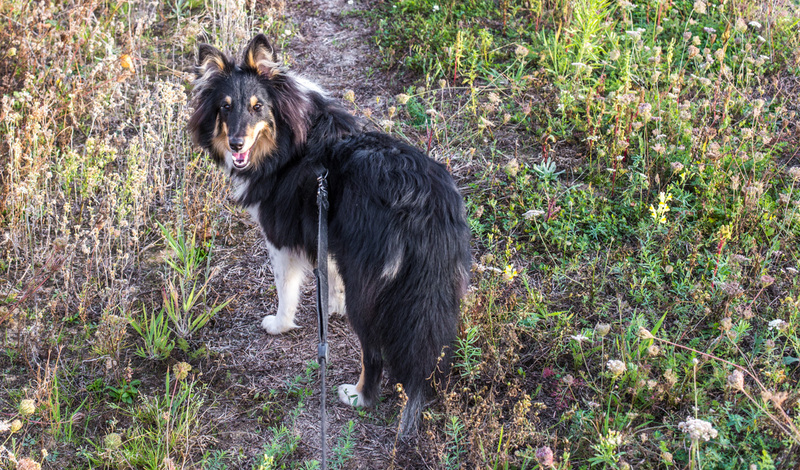 Tasha wanted to go outside at 04h30 this morning, so I got up, dressed, and out we went into the chilly pre-dawn air. The waning moon was high in the sky and pretty bright, but on the ground it was foggy. The effect was pretty, but, you know, it was 04h30 in the morning. Once the dog finished her business we went quickly back inside and back to bed. 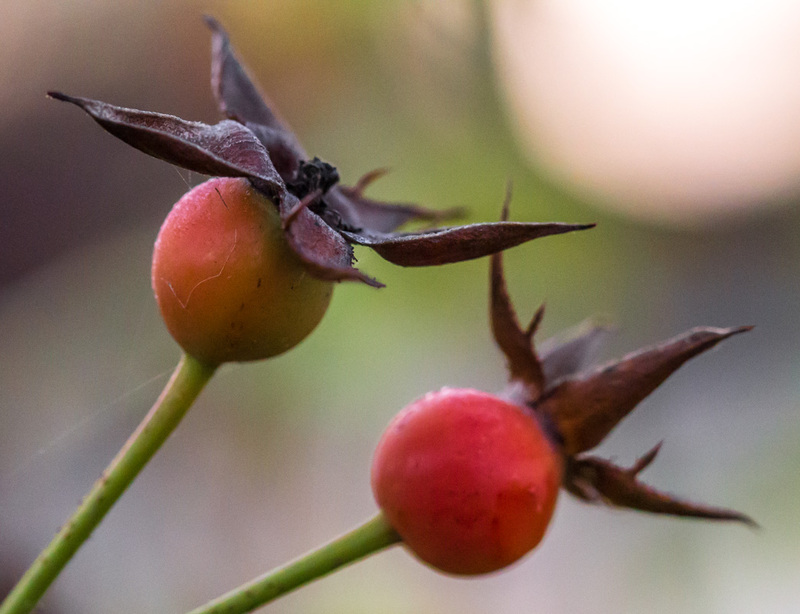 Another shot of rose hips. I do this every year, but what the heck. I liked the way they looked with the brown parts, whatever they're called. They cover the flowers' petals before they open. Today is predicted to be a rainy day, so we'll spend most of the day indoors. Poor Tasha. She has yet to encounter winter. Even though she was born in February, I'm sure she has no recollection of what it was like. 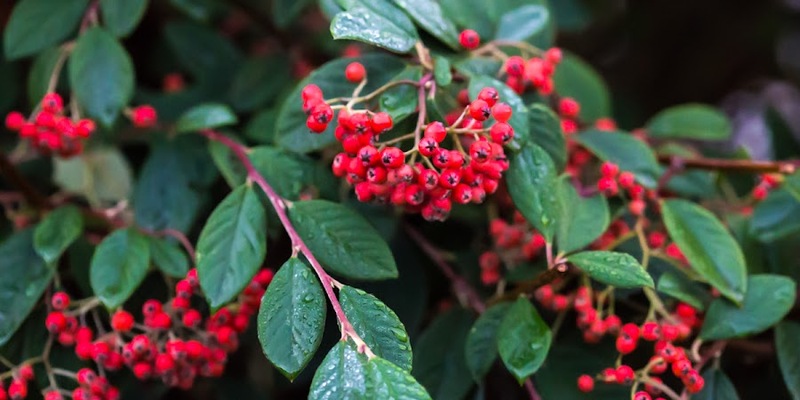 Fall is when the cotonéaster (cotoneaster) produces its vivid red berries. This plant belongs to one of our neighbors. Each fall, when I see the berries, I think that I'd like one of these in our yard, but then I forget about it. The result is that we still don't have one. I think cotoneaster is related to the pyracantha, a similar shrub I remember from our California days. We do have a tamarisk tree. It was planted by the previous owners. The problem with that tree is its location. Like many trees in our yard, it blocks views of other trees and shrubs. I think many things in our yard were planted when they were very small. They may have looked nice then, but it doesn't seem as though any thought was given to how big they'd grow, the huge shadows they'd cast, and the views they'd block. Two christmas trees (one of which we had removed in our first year here) are prime examples. This morning, with the tamarisk cut down, you can see the rounded-off bay laurel from the house. At any rate, the tamarisk is planted right in front of the bay laurel, essentially hiding it from view. You can see it in the back corner of the yard if you look at the photo in yesterday's post. Over the years I've cut it back to the stump, but it continues to re-sprout and grow. It's a hardy little bugger. Yesterday, I took the chainsaw out to cut it down again. Now I've got to clean up all the debris. 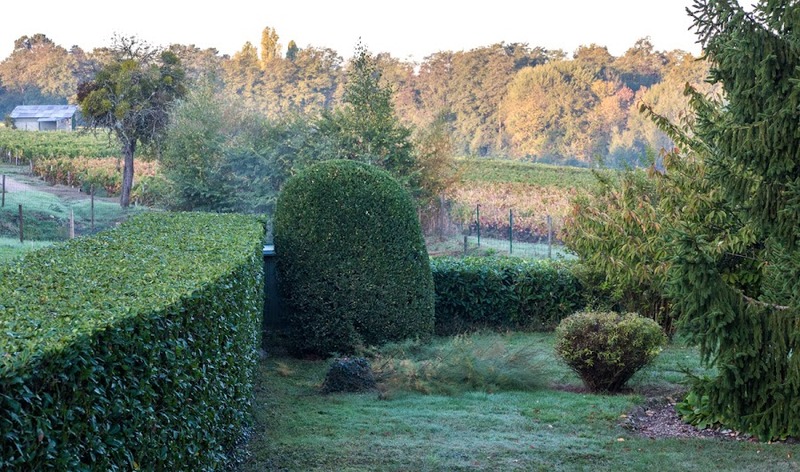 Our hedges got their annual trim yesterday. The crew of three arrived around eight in the morning and got started. One guy trims the sides of the hedges while standing on the ground. Another guy uses a scaffold to trim the tops of the hedges. A third guy rakes up the trimmings and loads them into their truck to haul away. This is the longest section of our hedge. It wraps around the yard in the back. They did the majority of the work in the morning. 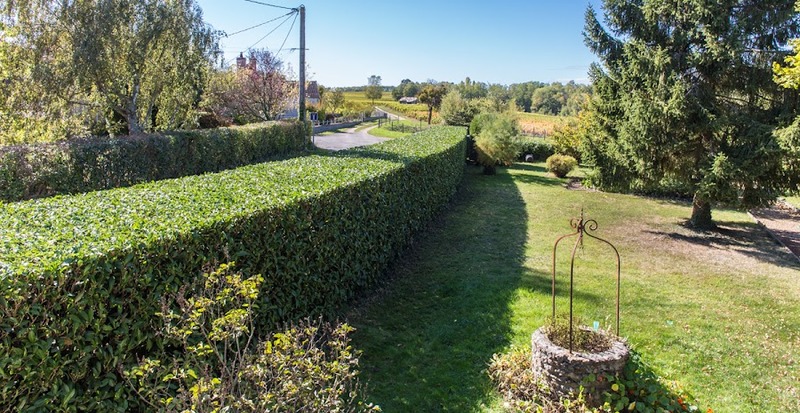 At noon, they had finished all the hedge work in the back yard before they knocked off for lunch, returning around one-thirty to do the shorter hedge in front. They had a nice, sunny day for the work. And now everything is neat and trim! If you've been a long-time reader of this blog, you might remember that I used to do this trimming myself, taking a week or more, teetering on a ladder to do the tops. One year I injured my back trimming some thick branches on top, reaching too far and too much with the heavy trimmer. I realized that (a) I really didn't have the proper equipment for the job and (b) I was just getting too old to do this kind of work myself. Besides, the hedges always look better when the professionals do it and I don't have to rake up and dispose of all the trimmings. Les radis noirs (black radishes) are unusual looking produce. The thick, black root vegetable doesn't look particularly appetizing, but it is very tasty. It resembles a daikon radish, but with a thick black skin. I saw this simple recipe for a black radish salad on a television cooking show many years ago and we make it a couple of times a year. I didn't think to take a picture of the radish before I peeled and sliced it. Here's the finished dish. First, I peel the radish and slice it into very thin rounds using a mandoline, then arrange the slices on a small plate. Next, I sprinkle sherry vinegar over the radish slices along with some salt and pepper. I use a vegetable peeler to cut thin slices of mimolette cheese, an orange-colored hard cheese from northern France, similar (except for the color) to an Edam cheese from the Netherlands farther north. 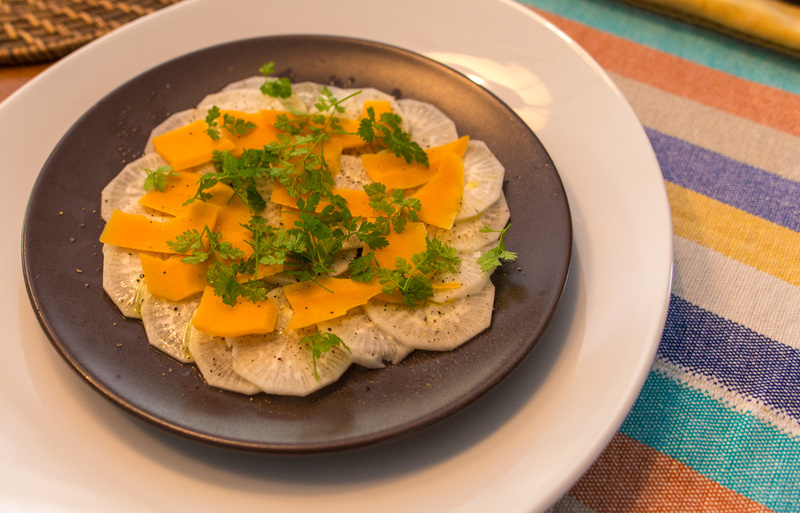 I place the cheese slices on top of the radish and drizzle some olive oil on top. Finally, the salad is topped with fresh cerfeuil (chervil) leaves (I just happen to have some growing in the garden). We ate this salad as a first course for yesterday's lunch. Yum! These grapes grow in a parcel that has been abandoned for years, since before we arrived more than fourteen years ago. The weeds and small trees are growing up around them, but they still produce grapes. 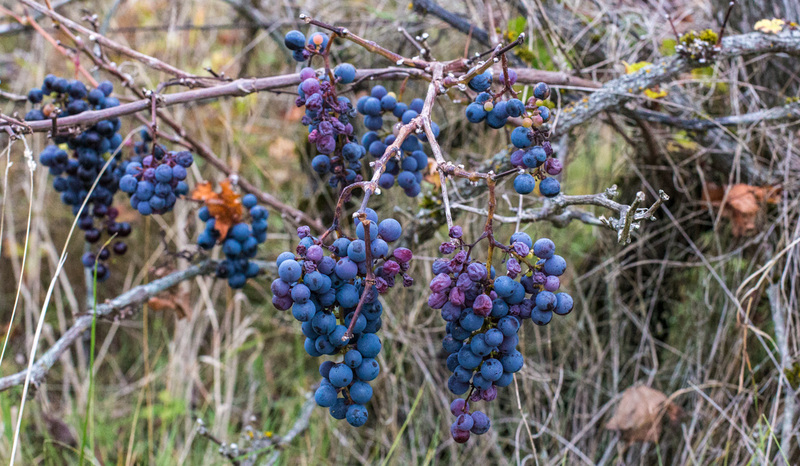 The grapes go unpicked and are either nibbled by the wildlife or they rot. Abandoned grapes (and a few raisins) on the vine. This morning is chilly and the heat came on. I can see my breath outside when I take the dog out. Of course, we are in the "brrrr" months. Septembrrrr, Octobrrrr, Novembrrrr, and Decembrrrr. I kid. The real cold months are January and February. After a week off, Tasha Tuesday is back. 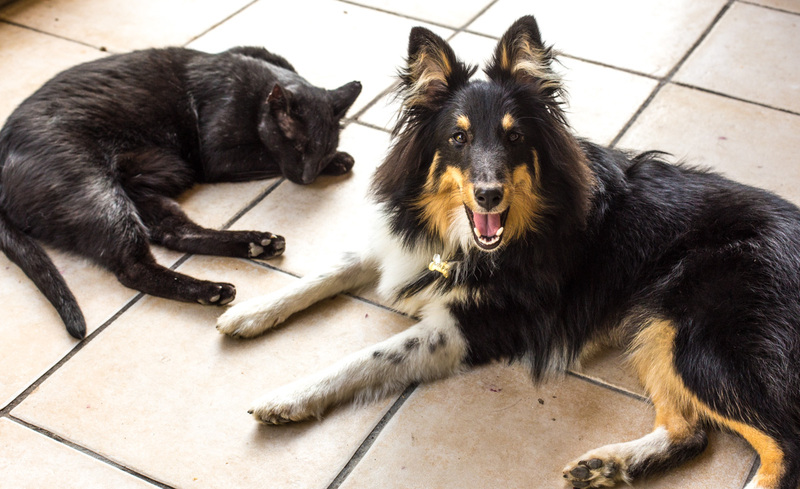 We are still happy about how Bert and Tasha get along. They mess around, but the upshot is that Tasha does not chase Bert out of the house. He gets to spend a lot more time indoors than he ever has. Most of that time is sleeping time. As cats do. 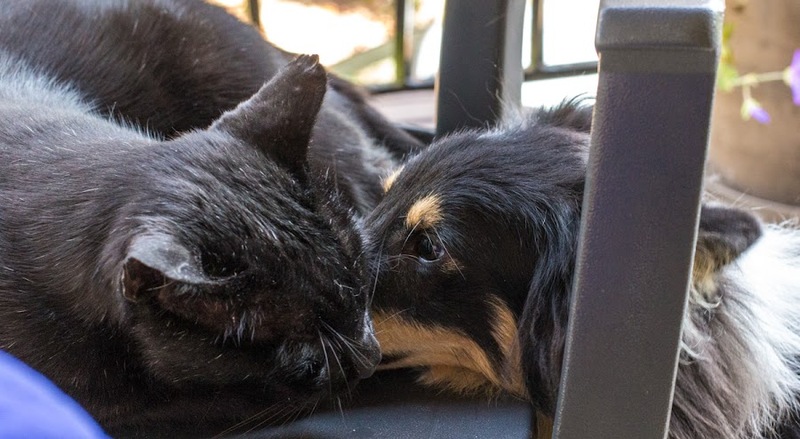 Tasha and Bert hanging out on the deck. She's bigger than him now. I think it will be interesting this winter. We still don't let Bert inside over night, but he has a good sleeping spot in the utility room, so he's not outdoors in the cold of winter. I'm sure he'd like to be indoors, but he also is a hunter in the wee hours, so letting him in and out is not something I want to do. A little kiss between siblings. Also, we don't have a litter box. He does his business outdoors, and I don't want that to change. So I want him to be able to come in and out at his convenience, and that means he spends his nights inside the utility room, and not in the house. But he has a warm and fuzzy place to curl up, so we don't worry too much. A section of the vineyard parcel just outside our back gate has its fall color on. More and more leaves are changing and I hope to get some good shots in the weeks to come. That all depends on the weather, of course, because I don't take the camera out in the rain. Looking back toward our yard. When I took these photos, I used a strong strip of velcro to attach Tasha's leash to one of my belt loops, leaving my hands free for the camera. It worked pretty well, but I'm afraid that one good tug might rip my belt loop, and she did tug a time or two. Now I'm thinking that I should wear an old belt and wrap the velcro around that. 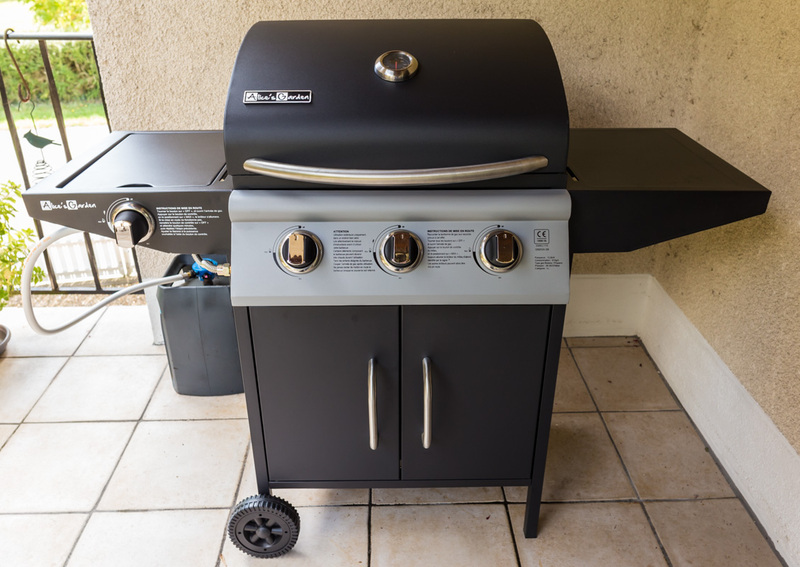 As promised, here's a photo of the new barbecue grill. It took a couple of hours to assemble, but it was not too difficult. The price was very reasonable, probably because it's the end of the season. Or maybe it was because I also looked at Weber grills, which cost about as much as a new car these days. Three main burners and another on the side (which probably won't get much use). On Friday, I grilled a nice steak for lunch. The new grill gets hotter faster than the previous one. The steak was done medium-rare and was delicious, but I realize that I have to adjust my cooking methods on the new grill. That won't take too long. I don't know how many more bbq days we have left this season, but I hope there will be a few more. By the end of the month I'll have to cover the grill and put it away for the winter. The control panel, for those interested in how such things are said in French. Click on the image to enlarge.